Last week, the Republican-dominated Federal Communications Commission and its Verizon-loving chair Ajit Pai rammed through a wildly unpopular decision to repeal Barack Obama-era open internet guidelines, potentially opening the door for internet service providers to start blocking or throttling anyone on the web they want or hitting them up for extortionate fees. 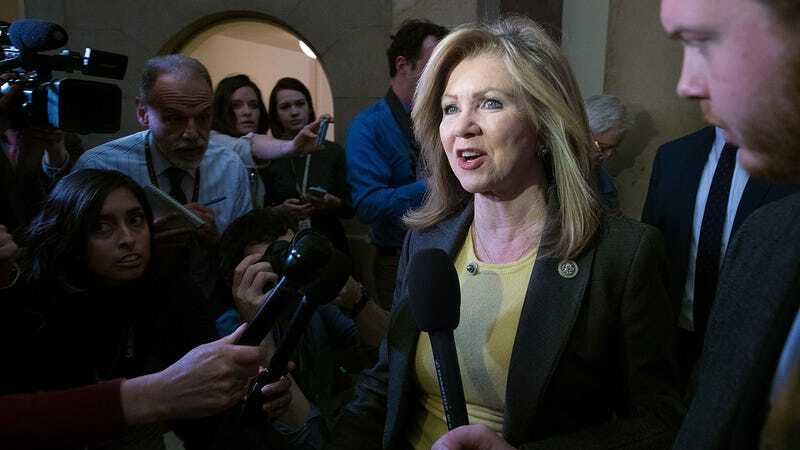 With the FCC abrogating most of its own enforcement powers, the only way to stop the decision is Congress—but the Republican solution, Rep. Marsha Blackburn’s “Open Internet Preservation Act,” is just as bad as you’d expect. Some media organizations have ran flattering headlines on the bill, like the Washington Post, which wrote that “Days after the FCC repealed its net neutrality rules, the GOP has a bill to replace them.” But it cannot be overstated that Blackburn’s bill does not do that. Instead, it offers a few bare-bones protections in exchange for the meat of the FCC’s decision to stay in effect. The text of the OIPA says it would amend the Communications Act to “prohibit blocking of lawful content, applications, services, and non-harmful devices, [and] prohibit impairment or degradation of lawful Internet traffic.” So great, Verizon literally can’t flip a switch and turn off Netflix, or (much more likely) deliberately throttle it. That’s a slight improvement on the regulatory environment in the wake of the FCC’s decision to abandon Title II common carrier regulations, the lack of which now allows ISPs to get away with pretty much anything. Yet Blackburn’s bill doesn’t prohibit ISPs from charging content creators like websites or streaming services for paid prioritization services. Because everyone will be fighting over a finite amount of network capacity, that’s tantamount to offering those that don’t pay up shittier service anyhow. It also reclassifies broadband Internet as an “information service,” which would prevent the FCC from ever regulating it as a Title II carrier in the future. Furthermore, the bill also prevents states and localities from implementing their own net neutrality rules and, as Ars Technica noted, would prevent the restoration of numerous consumer protections to broadband customers. While ISPs would prefer having the cookies jar emptied out wholesale for them Pai-style, Blackburn’s bill would entrench a regulatory environment they still would have killed for before Pai’s appointment. The proposal circulated today does not meet the criteria for basic net neutrality protections—including bright-line rules and a ban on paid prioritization—a nd will not provide consumers the protections they need to have guaranteed access to the entire internet. Net neutrality in name only is not enough to protect our economy or the millions of Americans that want and rely on these rules. Real net neutrality legislation should be bipartisan and have input from other stakeholders, including the user community, public interest groups, and industry. This is not real net neutrality legislation. It’s a poorly disguised slap in the face to Internet users from across the political spectrum. Blackburn’s bill would explicitly allow Internet providers to demand new fees from small businesses and Internet users, carving up the web into fast lanes and slow lanes. As Gizmodo colleague Dell Cameron also noted, Blackburn is not exactly a free speech warrior and accepting this bill as an attempt to ensure an equitable web requires ignoring pretty much everything she’s ever said about the internet. In 2016, she called for ISPs to force “anyone ... putting fake news out there” off the web, “whether it is the Russians, the Chinese, the Iranians or whomever.” In the past, she’s sponsored regulation to do exactly what the FCC did last week, further suggesting she’s motivated to posture against Pai’s awful handling of the vote rather than a substantive interest in net neutrality. While Democrats in Congress are trying to force a vote on a full restoration of the net neutrality rules, there’s numerous hurdles in the way of them doing so. Net neutrality organizations, trade groups and 18 state attorneys general are all likely to fight the FCC in court as well.